From Traverse City we headed north east on HWY 31 to the Petoskey KOA. 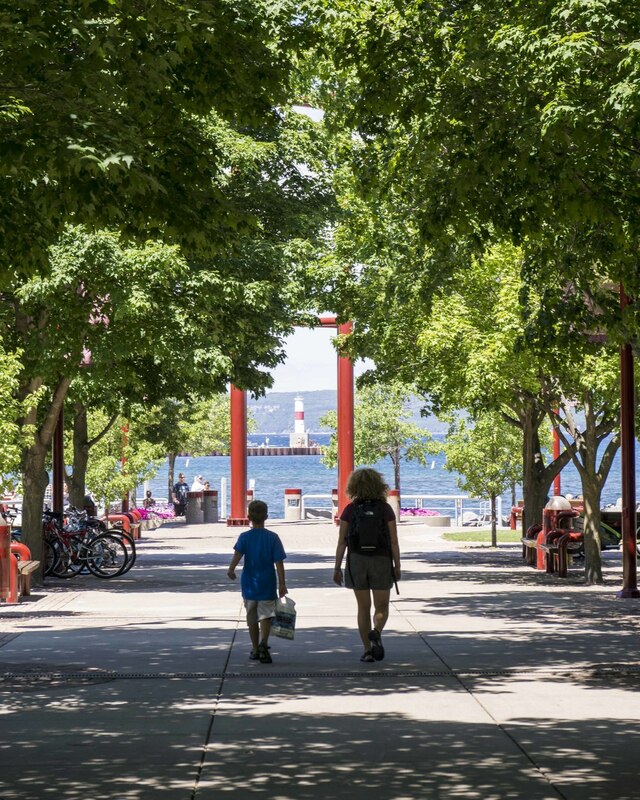 The Petoskey KOA is about 4 miles outside of Petoskey and very close to the Little Traverse Wheelway, which is a 26-mile bike path connecting Charlevoix, Petoskey, and Harbor Springs. 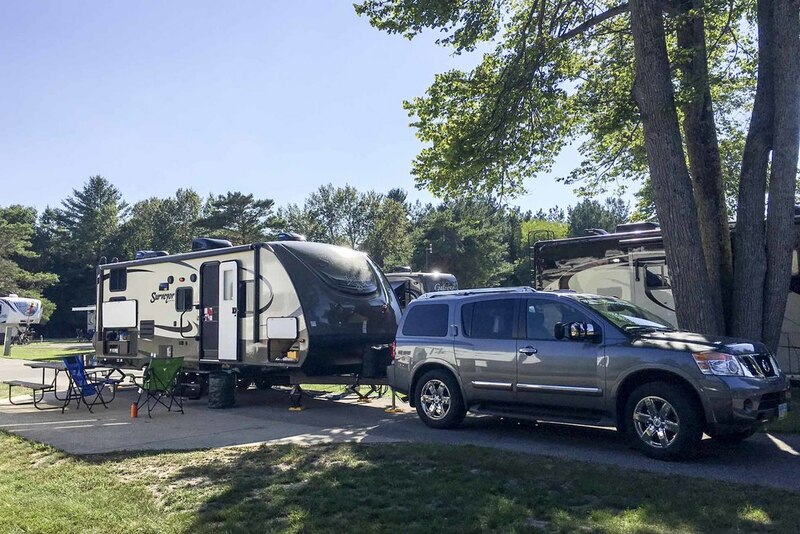 We had a great experience at the Petoskey KOA… the grounds are beautiful, the staff is great, the campground is very clean, and there’s even a café that makes and delivers great pizza (a big highlight for Daniel!). 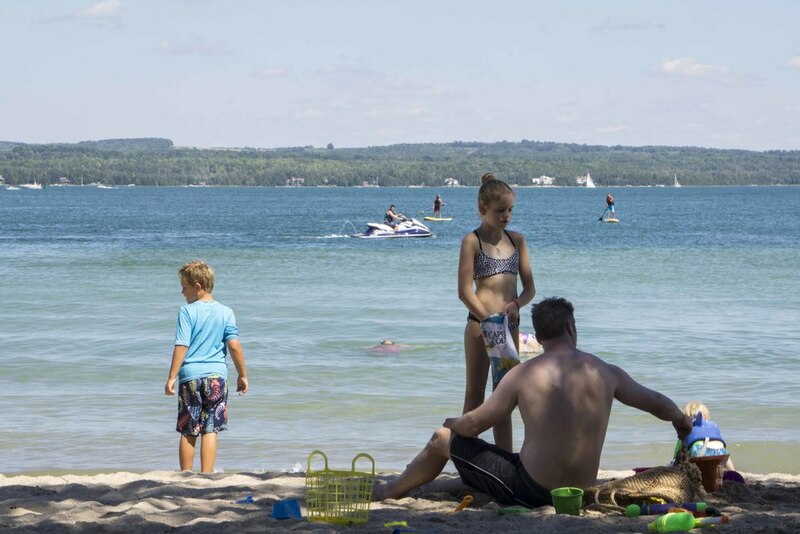 The Petoskey KOA has activities for kids daily except on Sunday, has a nice pool, and a playground which is best for young kids. We spent our first day exploring Petoskey on our bikes via the Little Traverse Wheelway. To reach the Little Traverse Wheelway from the Petoskey KOA, cross HWY 31 and go down the first road on the right, Shaw Rd. Shaw Rd. intersects Little Traverse Wheelway at the bottom of the hill. The Little Traverse Wheelway is paved and meanders along the lake. This is a great bike path for families and casual bikers. It was quite crowded and may frustrate serious bikers. The Little Traverse Wheelway took us to the Petoskey harbor and lighthouse where there’s also a playground. We explored a bit and locked the bikes for a walk up to town. There’s a walkway under HWY 31 that leads to the heart of Petoskey. There are a number of awesome restaurants in Petoskey and it was hard to choose which one to try! 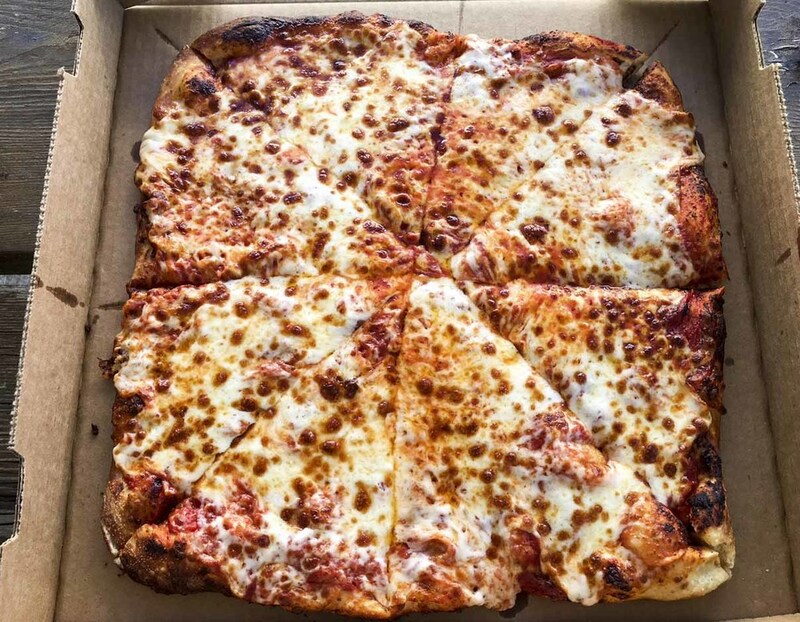 We decided on the Twisted Olive, which overlooks the bay. The Twisted Olive has 4 menus… the café and bistro menus are served from 8am – 3pm, the refresco menu is served from 3pm – 5pm, and the evening menu is served from 5pm to close. Since we visited the Twisted Olive around noon, we had the café and bistro menus to choose from… a breakfast menu and a lunch menu! 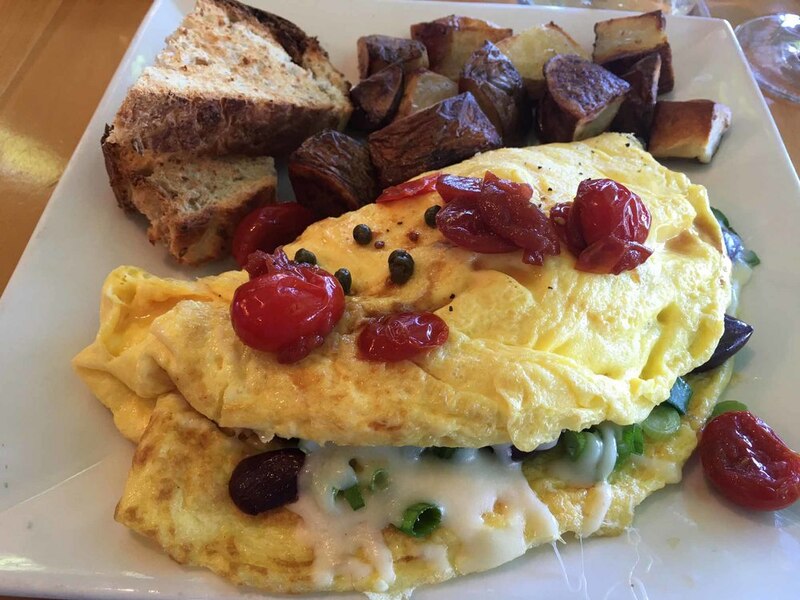 This was perfect for us… Todd is a breakfast lover and Daniel and I prefer lunch food. Todd had the Bloody Mary omellete, I had the Cobb salad, and Daniel had a special grilled cheese with bacon. Everything was awesome! 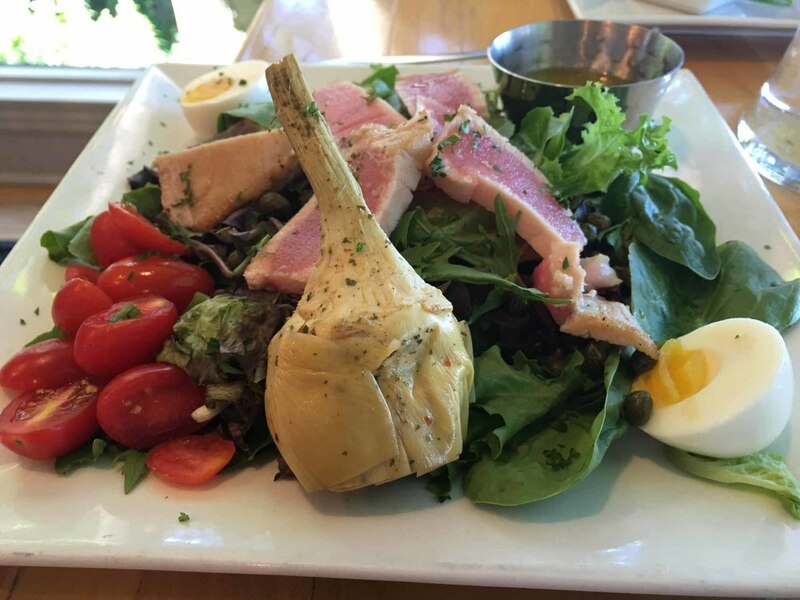 The biggest surprise was the Cobb salad… not like any Cobb salad I’ve had before… seared tuna, hard-boiled egg, capers, tomatoes, and a beautiful artichoke… it was divine! After lunch we browsed through town. Daniel loves Diary of a Wimpy Kid books by Jeff Kinney and he had read the two books he brought on the trip. We found Horizon Books which had all of the Wimpy Kid books, including one Daniel never heard of! Horizon Books is on East Mitchell St. and includes a coffee bar. We really enjoyed Petoskey… the vibe was great. One thing to note… we couldn't find a public beach and later learned that there is a public beach at Petoskey State Park. If you arrive by car there is a day use fee. If you walk or bike the fee is waved. We spent our second day in Charlevoix, which is a 30-minute drive west of Petoskey. When we arrived in Charlevoix we went to Lake Michigan Beach, which is at the mouth of the channel that connects Lake Charlevoix to Lake Michigan. There’s a pier and lighthouse, a beautiful sandy public beach, clean washrooms, and a snack shack. After checking out the beach we walked to town for lunch. We looked for a restaurant with a view of the water and picked the Bridge Street Tap Room. Daniel had a cheeseburger, which was really good, and Todd and I split some hummus and seared tuna. The Seared Tuna was outstanding! We really liked the casual vibe of the Bridge Street Tap Room, and the views are great from the dining room inside and the patio outside. After lunch we went to Ferry Beach on Lake Charlevoix. Ferry Beach is not as big as it looks on the local maps. It has a large park and playground and the sand is very nice. An item to note… not sure if there was an issue with the local sewer the day we were there, but the washrooms were in very bad shape. It surprised us because everything else in Charlevoix was top notch. As we rode back to Petoskey we reflected on our visit to the Petoskey/Charlevoix area… beautiful towns, very clean, flowers everywhere, great water, fantastic food… lots of things to do. We were there during the week and the towns were still very crowded. Also, the traffic is very congested. When we visit again, we’ll try to go at a less popular time of year. Older PostTraverse City... Something For Everyone!